In celebration of its 25th anniversary, the Asian American Women Artists Association has launched a campaign to create a collective mural honoring the contributions of women artists in the Asian American and Pacific Islander community. The community mural will be located in the Richmond District of San Francisco and is expected to be completed by the summer. “Mural Muses” would be one of the first large-scale murals in the Bay Area honoring Asian-American women artists, according to AAWAA. The organization will collaborate with Erin Yoshi and Cece Carpio, two prominent Bay Area Asian-American artists who are part of the Trust Your Struggle artist collective. Melanie Elvena, programs manager at AAWAA, explained to NBC News that the collaborative mural is another way to raise visibility for Asian-American women artists in a space that has traditionally been dominated by males. “The street art scene is mostly male—very male-dominated—so for us to commission these works of Asian-American women, I feel like it’s [making] a statement,” Elvena said. Elvena says the project is also a response to the lack of a physical space dedicated to Asian-American art. “We don’t have an actual physical space dedicated to Asian-American art, so we thought this is the perfect time to do this project and to put it out into the world, where people could go to a wall and see a mural dedicated to our community," she said. Asian Americans make up 33.3 percent of the population in San Francisco, according to 2010 Census estimates. AAWAA’s mural comes at a time of increased sightings of vandalism, hate crimes, and racial slurs directed at the Asian-American community. Elvena cites the recent arrest of a man in connection with the spray painted words “No More Chinese” throughout a neighborhood in San Francisco. Elvena adds that San Francisco’s creative arts community is currently going through some major changes. According to a recent survey by the San Francisco Arts Commission, 70 percent of artists acknowledged that they were being displaced or in the process of being displaced. 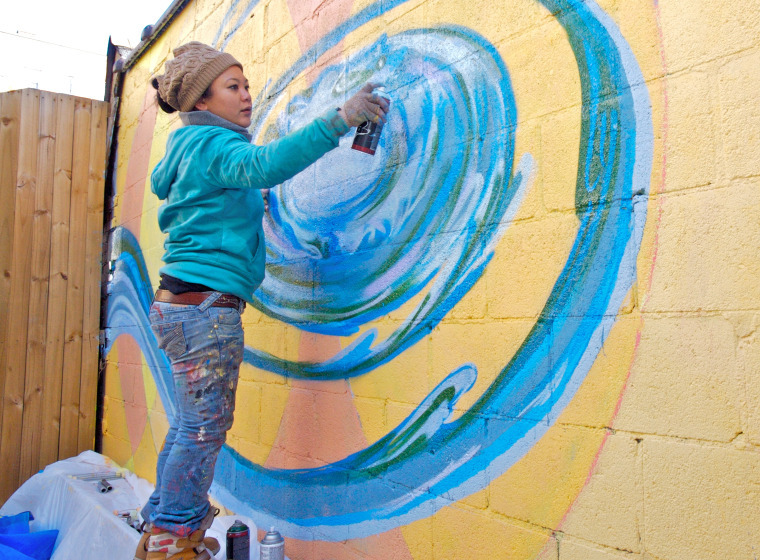 AAWAA’s “Mural Muses” project, Elvena says, comes at a crucial time when the organization is trying to hold its space down and continue its mission to empower artists.